There are growing expectations about the potential economic value and innovation that may emerge from the exploitation of big data—that is, the increased volume, variety and velocity of data in the economy. The age of big data has opened a new landscape for emerging businesses based on cutting-edge technologies and new service infrastructure such as cloud computing. In this workshop, we bring together experts from the industry, policy makers and academics to discuss the opportunities and challenges of data-driven business models in the digital economy. We focus on business models and disruptive innovations to examine the relevant activities, components and actors involved as well as to assess appropriate methodologies to study value creation in the big data landscape. After a discussion of the big picture, we will have a session dedicated to the financial services sector. The event will form the basis for compiling and assessing current research on the subject, building further research efforts and articulating networking activities organised by the network, companies and researchers supported by the New Economic Models in the Digital Economy Network (NEMODE). Start-ups and established firms working with big and open data, public organisations generating and using big data, non-profits and academics in the big data landscape. 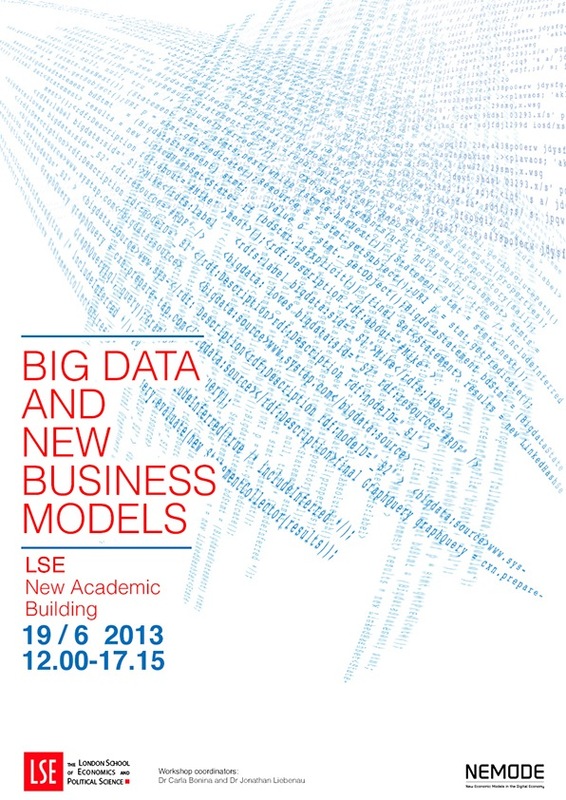 13.20-15.00 Big data and the big picture: what is the potential for new business models? The importance of data in economic activities is not new. The purpose of this session is to address in what ways the exploitation of big data may lead to create new value in the economy. We seek to understand fundamental questions such as: what types of business models are emerging in the big data landscape? Is open access to data important? What policies are needed to unlock value? What are the main barriers? What methodologies should we use for understanding these? The financial services sector has been traditionally a data-intensive industry. This session will introduce potentially disruptive innovations and examine how new business models find access to the incumbent players in the industry. Based on these innovations, we seek to explore what patterns and business models may be common to other sectors, such as media, health, advertising and utilities. We look forward to the discussion and many thanks to the speakers and participants taking part in this event. This entry was posted in big data, broadband, business models, Carla Bonina, creative industry, digital cities, digital economy, Europe, events, FinTech, ICT, innovation, internet, LSE Tech, mobile industry, mobility, open data, regulation, Research, social media. Bookmark the permalink.